GARLIC, in older belief, holds witches at bay, by putting some under a child's pillow, as is the Polish custom (Leland), while the Bosnian belief was that everyone should taste garlic before going to bed at the time when witches were traditionally active. Around Sarajevo garlic was rubbed on children's chests, on the soles of the feet and the armpits at Christmas and Easter, which are the times when witches attack people and eat them. While rubbing children with garlic on those days, a formula used to be recited: "When the witch has counted up all the blades of grass on the ground and all the leaves on the trees, then let her kill my child". It was also Serbian practice to put a garlic bulb (or a juniper twig) on the windowsill on the evening of St Thomas's Day (19 October in that calendar), which would keep witches from the house all the year (Vukanovic). TURNIPS have been used to keep witches away. African Americans in the deep south of the USA used to scatter turnip seed around the house for that purpose (R B Browne). Widd-bin, i.e., woodbine, is the honeysuckle. To be mentioned in the same breath as rowan is praise indeed. The widd-bin would be wound round a ran-tree wand, and then put over the byre door (Milne). Perhaps it was the spiral-growing (and clockwise) habit that gave it such a reputation (D A Mackenzie). The protection, then, lies not in any inherent quality of the plant itself, but in the way it grows. For there was a firm belief that witches or those who had the evil eye are forced to stop whatever they are doing and to follow out every detail of an involved design that they see. So interlacing and complex interwoven braided cords were deliberately made to distract, delay and confuse the evil eye, and were worn specifically for that purpose (Gifford) (JUNIPER operated in the same way; the deterrent was the leaves, every one of which had to be counted before the witch could proceed (M Baker. 1977)) Even when the honeysuckle wreath was used (by a witch, for often it was the witch who had to use the plant in order that its curative powers could succeed), to cure an ailment, as was certainly done in 18th century Scotland, it did not stop a witch from being charged (see the case of Janet Stewart under HONEYSUCKLE). Exactly the opposite can be quoted, as is always the case in magical patterns. The witches themselves will use honeysuckle against victims who will be using the same plant to protect themselves. In the ballad of Willie's Lady, for instance, the witch tries various means of preventing the birth of the Lady's child, including a "bush o' woodbine" planted between her bower and the girl's. Once this restricting, constricting, plant had been removed, the birth proceeds normally (Grigson). WOODY NIGHTSHADE is in the same category as Honeysuckle. Like any poisonous plant, it was said in the Highlands (Kennedy) to have great powers of evil. Such a witch plant would actually give people rheumatism! But it was used in medicine to cure rheumatism, as Lindley confirmed. VERVAIN is a great protector, either of the home (plant it on the roof and it will guard the house against lightning (Sebillot) ), or of the person. At one time, in the Isle of Man, neither the mother nor a new-born baby were let out of the house before christening day, and then both had a piece of vervain sewn into their underclothes for protection (Gill. 1963), while in Sussex the practice was to dry the leaves and put them in a black silk bag, to be worn round the necks of sickly children (Latham), probably rather to avert witchcraft than to effect a cure. ST JOHN'S WORT is just as effective. When hung up on St John's Day together with a cross over a house door, it kept out all evil spirits (Napier). Pennsylvania Germans fasten a sprig to the door to keep out witches (and flies) (Fogel), while in the Western Isles the emphasis was on preventing ordinary folk from seeing the witches (or "grisly visions", as it was described); it had to be sewn into the neck of a coat (Bonser), and left there. If it were interfered with in any way it could lose its power (Spence. 1959). White witches used it, too, in an "unwitching" medicine, which consisted of, among other things, three leaves of sage and three of St John's Wort, steeped in ale, to be taken night and morning (Seth). RAGWORT is in a different class. It is a fairy plant, dedicated to them in Ireland, and called Fairies' Horse, for it was believed to be a fairy horse in disguise (so is St John's Wort). Folklore equates fairies with witches in many particulars, the belief in their using ragwort to ride on at midnight being very widespread (Henderson; Hunt; Wentz, etc.). "As rank a witch as ever rode on ragwort" was a common saying in those areas where the belief was held (Cromek). CABBAGE stalks served, too (Wood-Martin), and of course so did BROOM. GROUNDSEL owes its very existence to witches, so it was once thought in the Fen country. A small patch growing beside an old trackway showed that a witch had stopped there to urinate; large patches meant that a number of them had met there to plot. Groundsel growing in the thatch was a sign that a witch had landed on the roof during a broomstick flight. It was also believed that witches could never die in winter, but only when the groundsel was in flower (even though it seems to be in flower all the year round). The point was that the witch could then take with her a posy of the flowers, by which the devil could then recognise her as his follower (Porter. 1969). On the other hand, it was quite common once as a counter-charm to witchcraft. In the Western Isles, on St Martin's Day, groundsel was used particularly when milk was being stolen by witchcraft (Polson), and there are records of the use of pieces of the root as amulets against the evil eye (Folkard). WATERCRESS was used by witches in the Highlands to steal milk, by cutting off the tops of the plant with a pair of scissors. At the same time a charm was spoken along with the name of a cow's owner, and ending with the words "the half mine, the other half thine". A handful of grass from the thatch over the byre would apparently do just as well. The counter charm was groundsel put with the milk (Polson. 1932). In Greece, BASIL was the instrument for finding a witch. While it was burning, a number of names were repeated in succession. A loud pop or crackle tells that the name of the offender has been reached (Lawson). BROAD BEANS are fairy food, but are associated with the dead, and with witches. Ovid said that a witch put beans in her mouth when she tried to call up spirits. On the other hand, spitting beans at a witch was a Wiltshire way of rendering her spells ineffective (Whitlock, 1992). Thou and thy men hoar stones shall be, And I myself an eldern tree (A J Evans). The proof that the "elder is a witch is that it bleeds when it is cut" led to the custom, on Midsummer Eve, for people from the area to meet at the stones, and to cut the elder, or at least the tree they thought to be the real one. There is, too, a folk tale from Somerset, called the Elder Tree Witch, where again the witch is the elder, and moves around the farm in the form of the tree (Tongue). At the same time, the tree offered protection. In America, it was said that an elder stick burned on Christmas Eve would somehow or other reveal all the witches in the neighbourhood; another American belief was that, if a small piece of elder pith was cut, dipped in oil, lit, and then floated in water, it would point to any witch present (originally a German belief, carried to America). If a farmer was losing livestock, and wanted to know whether or not the losses were due to witchcraft, he was advised to take six knots of elder wood and to put them "in orderly arrangement" under a new ash bowl or platter. If they were later found "all squandered about", then he would know that the cattle were dying from witchcraft (Brockie). An elder hedge secured many a home in Scotland from "undesirable attention" (McPherson), and at difficult dates in the calendar, May Eve for example, elder leaves were put on doors and windows to keep witches away, and an elder cross was fixed to stables and byres (McNeill). See under ELDER for many more examples. JUDAS TREE (Cercis siliquastrum) is another example of a thoroughly unlucky tree, for Judas was supposed to have hanged himself on one, being a haunt of witches (Dyer. 1889). FENNEL was used to ward off evil spirits (Emboden), and it was hung over the door along with other herbs of St John at Midsummer (C P Johnson). The 'bena-ndanti' of 16th century Friuli, who were the "night-walkers" who fought the witches on a psychic level, carried fennel as their weapon, while the witches carried Sorghum as theirs. It was said that these 'benandanti' ate garlic and fennel "because they are a defence against witches" (Ginzburg). A CARNATION was also used in Italy at Midsummer Eve, when the witches were specially active. All one had to do was give them a carnation. For any witch had to stop and count the petals, and long before she had done that, one was well out of their reach (Abbott). YEW, the "dismal yew" in Shakespeare's words, slips of which "slivered in the moon's eclipse" were among the ingredients of the witches' cauldron in Macbeth. But, as usual, yew was a strong anti-witch protector. Any place sheltered by yew trees is safe from witches (Lowe), and it was often planted at the south-west corner of a house for this reason (Jacob). "Vor den Eiben kann kein Zauber bleiben" is still a current proverb in parts of Germany (Elliott), and in the Forest of Dean a yew stick nailed behind the door prevented a witch from entering the house (Elliott). A plant as poisonous as HEMLOCK would naturally have an association with witches. "Root of hemlock digged in the dark" was one of the ingredients in the witches' cauldron in Macbeth, and Summers claimed that it was used by them either as a poison or as a drug, favoured mainly because of its soporific effects, and he quoted a formula for witch ointments that had hemlock as one of the ingredients. DEADLY NIGHTSHADE also appeared as an ingredient in these witch ointments as 'Morelle endormante'. SWEET FLAG was another plant used in witch ointments, one formula for which was "De la Bule, de l'Acorum vulgaire, de la Morelle endormante, et de l'huyle" (Summers. 1927, though these formulae were written by the 16th century Italian physician Della Porta). 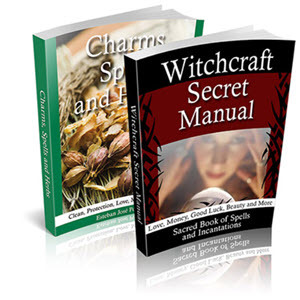 CINQUEFOIL is another ingredient used in these witch ointments, though just what it is doing amid the other poisonous or plain revolting ingredients, is not at all clear. But it was certainly taken as an antidote. Reginald Scot refers to the custom of those "who hang in their entries an herb called Pentaphyllon Cinquefoil", with hawthorn gathered on May Day, in order "to be delivered from witches". Cinquefoil appears again in a witch philtre for love or hate, composed of adders, spiders, cinquefoil, the brains of an unbaptised baby, and so on (Summers). BRAMBLE offered a physical barrier, as in Guernsey, where wreaths of it were hung from the rafters, the idea being that the witches would get scratched while flying through the air (McCulloch). Sometimes a sprig of bramble was used like rowan to put in or under the milking pail to ensure that the substance of the milk could not be taken by some evil agency (MacGregor), even burning bramble offers protection, for it is said that a bridal bedchamber ought to be fumigated as a safeguard against ill-wishing (Boland. 1977). ORPINE had the reputation in the Gironde region of France of being sensitive to the presence of sorcery - if there was a witch around it would wither as soon as it was brought near her (Sebillot). BLACKTHORN thorns were the ones used to stick into wax images made for black magic, and blackthorn wood was often used for a witch's walking stick (Wiltshire). This "black rod" carried by witches caused miscarriages, and when Major Weir was burned in Edinburgh in 1670, a blackthorn staff was burned with him as the chief instrument of his sorceries (Graves). In Russian tradition, ASPEN was the wood used to make the staff driven through a witch's heart, or simply laid on the grave, to make sure she stayed there (J Mason). THORN-APPLE (Datura meteloides) capsules were used in black magic, and it was certainly considered to be used by witches in their incantations (Trev-elyan). In Puritan times, those who grew it in their gardens were in danger of being burned as witches. Such hallucinogens, particularly Toloache, the cult of many of the Indian tribes of the American southwest, which are powerful enough to kill, or to bring about temporary derangement, or even permanent insanity, must have entered the practice of witchcraft (Furst). Certainly a malicious shaman could use the drug for his own ends (see Gayton). In Africa. a way of detecting witches is by Guinea Pepper , which may be Capsicum annuum, or perhaps C frutescens [see TABASCO PEPPER]. "You light a fire under the tree where witches habitually meet, and you put pepper into the fire. If there is a witch on the tree and the smell entangles her, she can't fly away and will be found on the tree in the morning" (Debrunner). One way of finding a witch in rural areas of India was to write the names of all the women of over twelve years of age on the bark of a branch of the SAL TREE (Shorea robusta). The branches were then steeped in water for a given length of time (four and a half hours apparently). If after that time one of them withered, the woman whose name was written on it was deemed a witch (Porteous). BLACK BRYONY was useful in dealing with a witch-hare, that is, a hare that is actually a witch metamorphosed into the animal shape. It was well known that such a hare could not be killed with ordinary shot. A piece of silver in the shot would do the trick, and if no silver, a piece of Black Bryony root would serve with the powder (Evans & Thomson).